Click here to visit the JOIN page. Congratulations Pre Primary Bulldogs on a fantastic first season of Auskick! The improvement in each and every one of you from the first week of the season to the carnival at Rossmoyne last week was incredible! Our main focus for this very important first year of AFL was learning the basic skills and the correct technique needed for these skills such as hand balling, kicking, marking, talking and probably most important of all – LISTENING. There was massive improvement in every one of these areas so well done champions! It was an absolute privilege to coach all of you future stars this year and I enjoyed every minute (almost :)) of it. I hope you all enjoyed this season as much as me and most importantly had fun learning the greatest sport on the planet. I would to thank all of the parents, grand parents, brothers and sisters, uncles and aunties and anyone else that helped make this year so much fun and assisted with washing jumpers, oranges etc. I would also like to thank Daniel Schmidt for his commitment this year as assistant coach and for putting up with me yelling at him so much. Thanks Daniel – great job mate! Thank you to Brooke for managing the team and a massive thank you to Renee Cailes for taking over as manager and doing a brilliant job! I hope this season of AFL was the first of many more to come for you champion Bulldogs! Year 2 Auskick started the season with 39 kids, the majority returning from the previous year with the addition of some handy recruits. It was a busy year with 4 games against Canning Vale at the kennel, a carnival at East Fremantle oval, an under lights game against Mt Pleasant Mounties, home and away fixture against Attadale and the Rossmoyne carnival to wrap up the season. The highlight for me was the games against the “Mounties” which our boys were younger, out-sized and not as developed but not one of our “terriers” gave up the fight, with enthusiasm taking a back seat to determination. Along with all the skills training a big focus this year was teamwork and bringing your teammates into the game. With the skills and teamwork progressing parents who turned out rain or shine were treated to some exciting passages of footy, evidenced at the Rossmoyne carnival with some precise kicking, running to space and great marking after the ball was kicked out at full back, making its way to the forward line and resulting in a goal without touching the ground or the opposition laying a hand on the ball. A huge thank you to Tim Gilliland for managing the team, from keeping us all organised, washing the jumpers (thanks Felicity) to bringing oranges and the boys favourite (lollies) for after the game. Also a big thanks for pulling on your coaches shirt when the need arose, cheers mate. On behalf of Coach Matt, Coach Simon and myself we would like to thank all the parents who helped throughout the year from setting up to packing up, goal umpiring, being involved in training and supporting our Bulldogs. A big shout out to Dean (Auskick Coordinator) for organising our games against our opposition this year and generally making Sunday morning run smooth. Big shoes to fill with Dean stepping down. To all of the Bulldogs, really great season boys, keep working on your skills and we’ll see you next season. The 2016 season kicked off on Sunday 1st May with bright sunshine and 108 keen and enthusiastic Auskickers. It was great to welcome a few new coaches on board which added to our already strong group of coaches who put their hand up again this year. The coaches not only set up sound training sessions each week to develop the children’s skills and techniques, they also made it a lot of fun and ensured that everyone was involved. A special mention to our team managers who did a fantastic job throughout the season ensuring that the Auskickers were well fed with oranges and treats as well as ensuring that Club jumpers were allocated, collected, washed and back again the following week. Thank you to all of the volunteers this season. Whether it was helping the coaches or being the first aid person, your help is much appreciated and goes a long way towards making the Booragoon Bulldogs a fantastic Club. A few highlights this year included a trip to East Fremantle for a Carnival, Auskick under lights against the Mt Pleasant Mounties, followed by a few Dads dusting off their boots for the Dads V Vets Match and Grandparents Day with all of the kids running through one of three banners. It was fantastic to see so many families supporting the Auskick groups. Other notable days were the numerous Year 2 games against Canning Vale and Attadale and to finish off the season, the Rossmoyne Carnival. Most importantly I would like to thank the boys and girls and their parents/grandparents for their commitment to the early Sunday mornings. It is very rewarding to see the improvement of each and every player throughout the year. Finally I would like to thank everyone who has supported me in coordinating our Auskick program over the past couple of years. 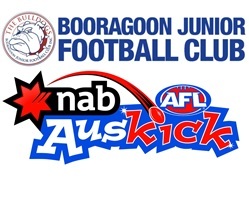 I have really enjoyed the role and although I will be moving to the junior side of our football club next season, I will provide a hand over to our next Auskick Coordinator to ensure the continual strength of Auskick at the Booragoon Bulldogs in 2017. The Year 1 Auskickers had a great 2016 season. This is the second season that Brad, George and I have coached this group and we have seen significant improvement in the group as whole with weekly games showing improved teamwork and skills. We had some wet sessions this year which were endured by the coaches and relished by the kids. Special thanks to Drazen who came in as a coach mid season. On behalf of the coaches we would like to thank you for your participation and enthusiasm and we look forward to seeing you all in 2017. AFL Auskick Packs have finally arrived and will be available to pick up from Karoonda Park on Sunday 20th of March between 10AM and 12PM. We also have 2015 Yearbooks available for returning players. To receive a pack you will need to be Registered for 2016 and have paid fees – please bring your receipt on the day. If you haven’t done so yet, you can register and pay online by clicking here. There will be limited facilities to Register and Pay on the day, it’d be great if you can do this online beforehand. Well Team we’ve made it through another season! On behalf of Lleyton, Ben & I, thanks; we had a blast. We hope you all improved your ball skills, leant something about football, liked the teamwork, but most of all we hope you had some fun. I’m sure everyone will agree that all of the boys have improved, and are playing with great teamwork. The handball and run out of defence has been a highlight! During the year we played against Piara Waters; one team at home & one team away. It was great to see & hear about the teamwork; run out defensive, a string of handballs, a couple of great shots on goal, and some big marks. For the record both teams won, and I think a few parents were surprised with how well the boys played. To the parents; thanks, obviously things just don’t happen without people getting involved, so from helping set up, clean-up, team jumpers, kitchen rosters etc., simply thanks. Each weekend could not have run without your involvement. As coaches we enjoy every Sunday morning, and I’d encourage you to get out in the backyard or park, and keep kicking, handballing, marking, or just walking & talking with the boys. They are a great bunch, and its privilege to coach them. Finally, to my little mates Lleyton & Ben; you’re both champs. Lleyton brings the fun factor and enthusiasm, while Ben’s the quite achiever; thanks guys.